Sanjay Joshi was born in 1959 and grew up in Bombay, India. At the age of 22 he emigrated to the US and now lives in Pennsylvania, where he is a professor of industrial engineering at Penn State University. 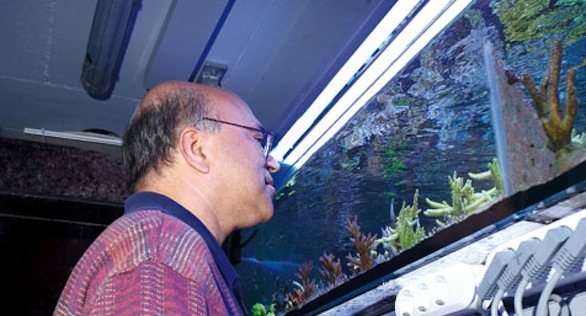 Aside from his professional work, Sanjay has been a dedicated reef aquarist for decades, and because of his involvement in engineering, one of his special interests in the hobby is on the technical side: the lighting of coral reef tanks. For many years he has been analyzing and comparing the light spectrums of literally all the available lamp types used in this field. Lately he has been focussing on LED lighting. CORAL: Sanjay, how many years have you been maintaining coral-reef aquaria? And how did you get into the hobby? Prof. Sanjay Joshi: I have been keeping coral reef aquaria since around 1991. When growing up I was always fascinated by fish and aquariums, and I kept and bred several freshwater fish species in India, where aquarium-keeping has many serious enthusiasts. I used to spend all my little allowance on fish and aquariums. I had to give it all up when I came to the United States as a graduate student. For the next few years after coming to the US I did not have any aquariums, but admired them from afar. I was living in West Lafayette, Indiana while working toward my Ph.D. from Purdue University, and the Shedd Aquarium in Chicago was one of my favorite weekend trips. After getting a job at Penn State and purchasing a house, one of the first things I did was to set up a freshwater aquarium to fulfill my childhood dream of keeping discus. I did that for almost two years, until I walked into a store that had the most beautiful 30-gallon (114-L) reef aquarium I had ever seen. I had always wanted to keep saltwater fish and was already contemplating it. When I saw that reef tank I knew exactly what I wanted and plunged right in, and I’ve been doing it ever since. It has never become boring and has managed to keep my interest for 20 years. The size of my home tank has increased from 29 gallons (110 L) to 500 gallons (1900 L). The hobby has a lot to offer, with so many interesting life forms, challenges, and learning opportunities. Boredom doesn’t exist in this hobby. CORAL: What do you consider to be your most exciting experience in the hobby? Some type of breakthrough? Or a certain tank you maintained successfully, for example, the big reef tank at the Penn State Student Union? Prof. Sanjay Joshi: Reefkeeping is a very interesting hobby, and given the wide range of animals that one can focus on, there is always something new to learn. I have had success in keeping tanks large and small, both at home and at the university, and I really enjoy the learning experience each one provides. Of course, the most unforgettable experiences are the ones that deal with “disasters.” How could I ever forget the frustrated voice of my wife calling me in the middle of the night when I was in Europe to tell me there was water running out of the tank? Or the time when all the fish in the tank died overnight? But my most exciting and rewarding experiences have come from the friendships I have developed all over the world, and the opportunities to travel and see reefkeeping in different countries. Nothing beats traveling thousands of miles, seeing reef aquariums, taking road trips, and sitting over a few beers discussing reef aquariums in spite of language difficulties. We have had fun drinking wine and hanging out in coral farms in Germany! CORAL: I‘ve been observing the development of LED aquarium lamps for many years, but it has taken a long time for them to become popular in the hobby. For years this was due to the high price and low performance, but it seems that a more favorable ratio between cost and performance has now been achieved so that the technology is starting to spread to the average user as well. What do you think are the chances that some types of LED lamps will become comparable in importance to metal halide lamps and fluorescents for growing corals? Prof. Sanjay Joshi: The high cost in relation to performance has limited the broad acceptance of LEDs in the hobby. But, as with any new technology, it takes a while for costs to drop, and they are now not too far from those of conventional metal halide and fluorescent lighting, especially when you start to consider other factors, such as energy usage. We are seeing a lot of new medium-sized setups with LEDs. In fact, I have changed the lighting in my three smaller aquariums (less than 50 gallons/200 L) to LEDs. I am waiting for the day when it becomes cost-effective for my 500-gallon (2,000-L) tank. I can see this happening in the near future. CORAL: Technically speaking, LED lamps can make it easier to set up far smaller tanks with bright lighting. Do you expect that LEDs will contribute to the further development of nano reef tanks? Prof. Sanjay Joshi: Yes, the current state-of-the-art LEDs and lower initial costs for lighting smaller aquariums make them almost ideal for this application. The biggest problem with small aquariums using conventional lighting is the heating of the water, perhaps necessitating a cooling unit. Using LEDs, there is no need for cooling, and this makes the nano aquarium simpler and cheaper to set up and run, thus increasing its potential for widespread use. In addition there should be no need for lamp replacement, thus making smaller aquariums even cheaper to operate in the long run. CORAL: Based on your experience, are there any types of zooxanthellate invertebrates that do not do well in general under LED lamps? Prof. Sanjay Joshi: I think people need to realize that a photon is a photon, independent of the source of light. Just because it comes from a light-emitting diode does not make it anything special or different in terms of photosynthesis. As long as the LED can provide enough photons of light over a wide enough spectrum, there should be no problem keeping any kind of zooxanthellate invertebrates. I have not come across any that suffer just because the light is coming from LEDs. CORAL: If someone wants to set up a reef tank—let‘s assume it is a relatively small one, say 26 gallons (100 L) in volume—and he or she wants to equip it with an LED lamp, what groups of cnidarians would you suggest concentrating on? Prof. Sanjay Joshi: There are sufficient choices available in LED lighting for smaller aquariums that there should be no limitations on what people can keep, provided they make the right choice. There are LED setups that can easily provide enough light intensity for the most light-hungry of corals. As long as the aquarist has the skills necessary to keep the animals alive, he will be able to find the right LED lighting setup for them. CORAL: Thank you very much for this interview, Sanjay. Submitted by michael.maddox on Thu, 09/01/2011 – 03:12.